Fuggi dalla città per un giorno nel deserto e vivi la tua esperienza catturata in questo tour safari da Dubai. Dopo il ritiro in hotel o in un'altra posizione, trasferisciti nel deserto, dove l'avventura ti attende. 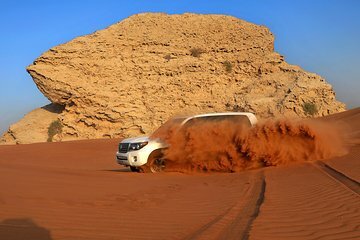 Mettiti alla prova con il sand-surf e il cammello, posa per fotografie tra le dune in abiti tradizionali arabi e goditi una deliziosa cena barbecue mentre la tua fotografa incornicia la tua giornata con la macchina fotografica. I booked with ToursGuys i was hesitate to book coz they are new in viator But i made a right right choice just loved the fact they are just amazing.. Our guide was so helpful and kind answer all the curious question we had Told us about the history of Dubai and bedouin culture. Dune bashing about 40 min was just awesome we stopped in middle of the desert for sand boarding and photo secession, from there 15min to reach camp where we had all the fun. Upon arrival Camel ride, Shisha, Henna tattoo, Delicious dinner specially grilled BBQ, Tanoura showspinning guy, belly dance : @ last star gazing..... Special thanks to Mr. Fahad for amazing photograph.